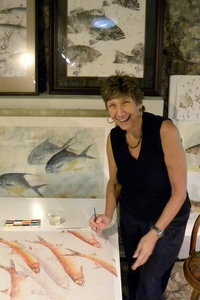 Heather Fortner first saw a fish print, gyotaku, in 1976 on the island of Lana’i in the Hawaiian Islands and has been printing and studying this art form since. The sea is an elemental part of her life; the art of fish rubbing resonates with her as the ultimate blend of the artistic and marine realms. She pursued this passion for the sea by authoring a book on Hawai’i’s edible seaweed while earning a degree in Natural Sciences from the University of Hawai’i in 1978. For 30 years her life involved working on and around the ocean; first as a commercial fisherman Hawai’i, then as a deckhand on research vessels in Hawai’i and Alaska, and finally as a ship’s officer and Master in the US merchant marine. She would often set up a studio on board the large merchant vessels, and print fishes caught from the vessel or found in fish markets in foreign ports. This travel gave her access to unusual fish as well as the opportunity to study with some of the Japanese Master Gyotaku artists in their studios in Japan. After years of working in makeshift spaces on board ships, she created a printmaking studio in Sarasota, Florida – the Orchid Street Studio. She taught and created out of this studio for ten years, and now has relocated to Toledo, Oregon, a few miles inland of Newport on the Central Oregon Coast andhas been working from her Sea Fern Nature Printing Studio since November 2012.